Last weekend, our book club met to discuss last month's pick, Cutting For Stone. C was a lovely host and put together a fantastic spread of food and drink: veggies, baked brie with jam, warmed spinach dip, fresh-baked cookies, and wine. The five of us chatted about some of the most dramatic events in the book, talked about how we each thought the names were pronounced, and tried to figure out what exactly "cutting for stone" means. Overall, we enjoyed the story and thought the book's language made it a superb read. 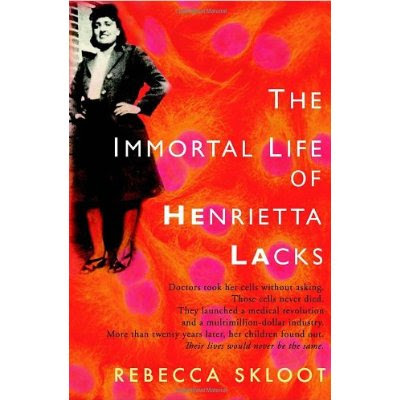 Our next selection is The Immortal Life of Henrietta Lacks by Rebecca Skloot. E spotted this book when she picked up Cutting For Stone and offered to host the next meeting on June 11. I suppose we are on a "medical" kick here, but this book is actually based on a true story (and years of research) and uncovers the woman behind HeLa cells, which have contributed to numerous medical studies and discoveries. Science journalist Skloot makes a remarkable debut with this multilayered story about faith, science, journalism, and grace. It is also a tale of medical wonders and medical arrogance, racism, poverty and the bond that grows, sometimes painfully, between two very different women—Skloot and Deborah Lacks—sharing an obsession to learn about Deborah's mother, Henrietta, and her magical, immortal cells. 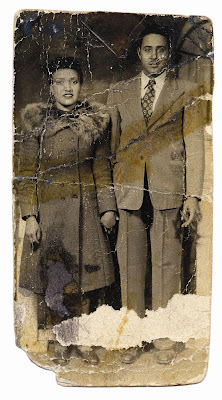 Henrietta Lacks was a 31-year-old black mother of five in Baltimore when she died of cervical cancer in 1951. Without her knowledge, doctors treating her at Johns Hopkins took tissue samples from her cervix for research. They spawned the first viable, indeed miraculously productive, cell line—known as HeLa. These cells have aided in medical discoveries from the polio vaccine to AIDS treatments. Henrietta and David Lacks, circa 1945.